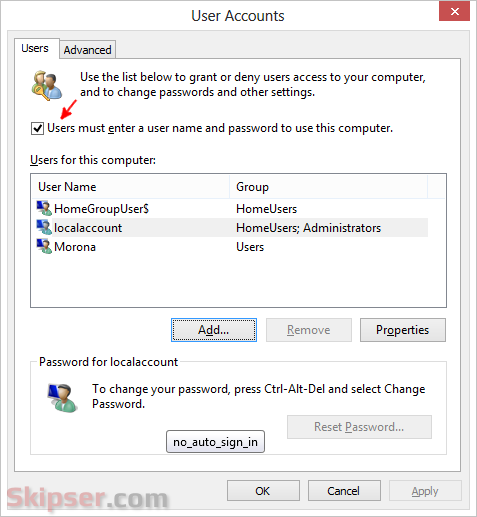 How to Disable User Auto Login in Windows 8. Windows 8 has an annoying feature - it automatically sign's in as the last user who shutdown the computer if his/her account is not protected with a password. That means if your mom opens the computer after you have shut it down, she will automatically get logged in to your account. Although she can log off and login to her account, its like a daily pain. Preventing windows 8 auto login. There is an easy way to prevent this and make Windows 8 ask for a user account to login each time. But first let's see some technicals. If it is set to 1, Windows 8 will show a tile of users to select and if set to 0, it will resort to auto-login. But there is another problem. LoginUI.exe program which runs while starting up automatically sets this to 0. That means even if you manually set it to 1, it will only be in effect for the immediate next login. After that windows 8 will again resort to auto-login. 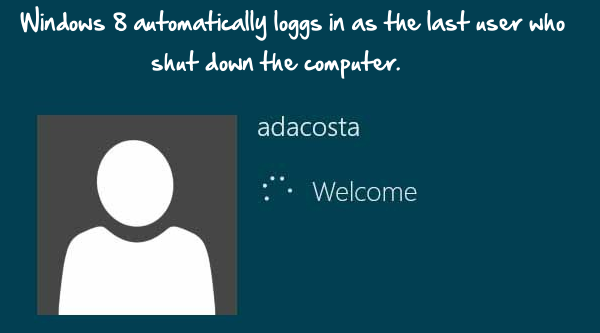 So the trick to prevent auto login in Windows 8 is to have this switch set to 0 every time somebody logs off. You can either do the trick yourself or use a tool mentioned at the end of this post. 1. Press Win+R keys to open the "Run" dialog box, type netplwiz and press enter. 2. In the window that comes up, check the option called "Users must enter a user name and password to use this computer". 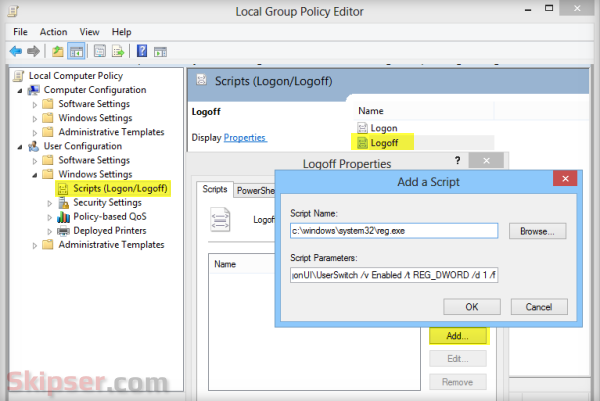 User Configuration -> Windows Settings -> scripts(Login/Logoff). Now double click on Logoff on the right pane and then click on the Add button. If you are skeptical of doing it yourself, you can as well use this handy tool "User List Expander" which also does the same thing. Also see: Get back the Windows 7 style Start button in Windows 8. Using the method of changing the Enable to 1 permanently seemed to cause problems , especially with UAC and entering a password for an administrative event. But I worked out how to fix this with out causing any other issues. This is what I did. 6. Now edit each User, Advanced Permissions and uncheck/untick 'Create Subkey' (This stops the key being recreated). If there is an issue you can just merge the Userswitch.reg file you backed up and then re-edit 'LogonUI' key and check create subkey. But I haven't had any issues at all with this method. Works in Windows 8 and 8.1, Pro and Core. Good Idea. But, don't delete the UserSwitch Key!! It's being used to read the value everytime the boot screen appears. Just change it to "1" and stop the key being changed by the system by changing the permissions. Thanks for your input, but at the start of my post I mentioned about changing the option permanently to '1' causes problems with User Account control in a Standard Users account when prompted for the Administrator Password to make changes. If you have all Administrator counts then yes permanently setting to '1' works fine,. How to Auto Delete Old Emails In Any Gmail Label. Facebook Will Pay You to Invite and Have Your Friends Sign UP. Disable Sharing Google Drive Folders After Expiry Date Automatically. 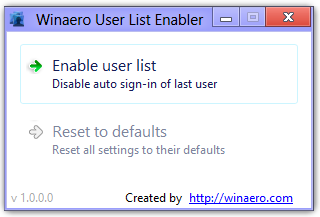 Quick trick to prevent and disable Windows 8 automatically logging into the last use account who shut down the computer.